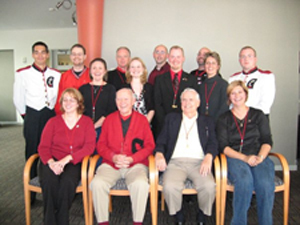 In 2007, Julie Ann Benken, longtime Drum Major and Staff member for the band program at the University of Cincinnati, passed away after a long and recurring bout with breast cancer. After fighting through two different recurrences, the cancer finally overcame her. This was a great tragedy to her Band Program. Sheleft in her wake a strong desire to recognize Drum Majors in some way – a project her family shared in both determination and zeal. 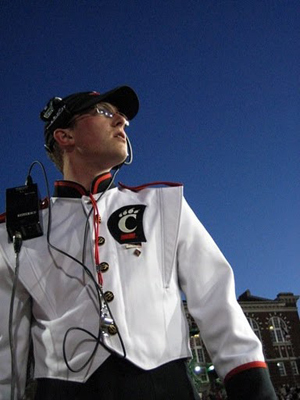 Nick DelleCave, a UC alumnus, former Drum Major, and friend of Julie, determined that a social recognition Society should be formed in her honor to create a formal way to thank and honor ALL Drum Majors for their service to their institution, and the community at large. He, along with Chris Kannel, assumed Chair and Vice-Chair positions, respectively, and began the work of building the necessary internal support to make this a reality. Around that same time, Nick determined to create an annual event to support the recognition purposes of the Society. With input from several sources and after subsequent meetings with University of Cincinnati band director Dr. Frenz, Nick was able to secure funding to purchase gold whistles for each past Drum Major we had on record for past Drum Majors at UC. Nick then approached then bandmember and Drum Major Rob Jaques to assist in utilizing his skills to create the logo of the Society. With Nick’s vision and Rob’s skills, the two were able to create the symbol which now exists as the Coat of Arms, or Crest, of the Society. Nick immediately used this design to create the official lapel pin of the Society – the symbol of membership within our ranks. Nick secured funding from his from Dr. Frenz to purchase and order the pins, which arrived in time for the first Drum Major Society Reunion. A few months later in 2007, Nick again worked to get the word out about the Society Reunion and did so in conjunction with his alma mater’s Homecoming the following fall when most alumni return to campus. Invitations were designed and sent to those who were to be inducted. At Homecoming, nearly 17 past Drum Majors were formally recognized and thanked for their past service with both a Society pin and a Gold Whistle and red lanyard. 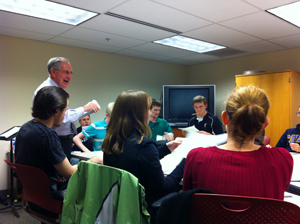 During the first several years of the unofficial founding of the Society, all funding was provided by Nick and several others who chipped in along the way. As a “club” of sorts, we used our personal funds to support the operations of student Drum Majors as dutiful alumni of our respective institutions as a desire of Julie’s family and to continue to have a legacy founded in her honor. These first few years involved mostly basic support in the form of uniform assistance, whistles, logistics, and training where needed and/or requested. This, along with on-site formal discussions with the students, really began to pay off in their performance and we determined we should develop a formal training program through the group to assist any students interested in becoming a Drum Major. Initially, Nick did this work by simply setting up side meetings with interested kids and working with them, uncompensated, at a time most convenient for them. After some discussions with Rob, the only other officer at that time, the two determined that a more formal training situation needed to be created for consistency and legitimacy and began the process of scheduling sessions to work with the kids. Nick handled this in the first year while also experimenting with other students on a more formal model that would stand the test of time. 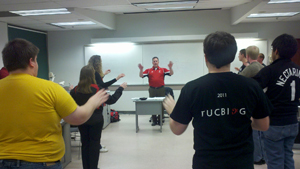 In 2010, new alumni Drum Major John Stueve stepped up and agreed to assist with the training program. He guided the courses for the students, developed the lesson plans and worked with all parties to ensure the content was valid and had educational value. During this time Nick had developed a more formal program and added in parts to supplement John’s efforts with the students. The combined efforts produced some of the best trainees we have had and expanded the number of people who could become a part of the Society. In 2011, the Society expanded under Nick’s leadership. He expanded the Board to include himself, Rob, John, alumni Drum Major Drew Reynolds, and then current UC Drum Major Corey Knapke. The five (5) gentlemen comprised the “Board” and had titles suited to each the area in which they worked. These unofficial titles helped us begin organizing tasks by area of expertise. The team worked to refine the training program once again, and this time succeeded in created the program in use today. Their help and assistance in making this program possible has made The Drum Major Society the group to grow and assist the education of students in the program. The program is offered free of charge to high school and collegiate level students, and supplies are donated by Society members and friends of the group. At the same time, the group began the initial phases of considering non-profit tax-exempt status and had developed a side committee led by Nick to address the legal issues. The committee convened and determined that a more professional listing of officers and duties should be created, so titles were adjusted to commit roles as prescribed by the State of Ohio and basic functions within the Society. These and other legal matters were settled in a binding and agreed upon set of by-laws, which were ratified upon the date of the Society’s incorporation with the State of Ohio. The Board also agreed to add two (2) more at-large Board positions just prior to filing. Today, the Society is working hard on our training class offerings and students are being trained and educated in the art of conducting through the various workshops and guest clinicians offered by the Society throughout the Cincinnati area. The group has also updated its website to include its status, opened a bank account to begin formal transaction of monies, and has setup an internal dues structure for members. These basic fees assist in the operation of the Society and its activities.